Fish and Boat Commission workers are raising walleye in Pymatuning Reservoir. The origins of species that the walleye are part of — the perch family — are a very old fish. According to the Pennsylvania Fish and Boat Commission, fossils within this family have been found in the western region of the United States to be 38 million years old. The walleye today are a sought after species in Pennsylvania’s freshwaters. These fish can yield in a good-sized catch and make a tasty meal. Since there are little to no reproduction in the wild of walleyes across the state, their journey begins with being stock raised by state Fish and Boat Commission. Getting these fish from eggs to fry is a process. One of the places this process begins in the Pymatuning Reservoir, located in the northwest corner of the state and spreads into Ohio. This body of water is has a dual use. On one side, the sanctuary side, no fishing or boating allowed, while the other is a popular body of water for catching a variety of species of fish. Along the sanctuary banks is the Linesville State Fish Hatchery. This is where Jared Sayers, hatchery manager with the Fish and Boat Commission, and his hard working staff of the hatchery put in some long hours when the ice melts and the water opens. At this time, the commission will begin a collection of an average of 7,000 adult walleye, taken out of the sanctuary. Of those 7,000, 1,500-2,000 are females, which are used to spawn. This happens each year, helping to build a future for warm water fishing across the state. “Each fish has around 66,000 eggs with a goal for 2018 of collecting 83 million eggs,” Sayers said. 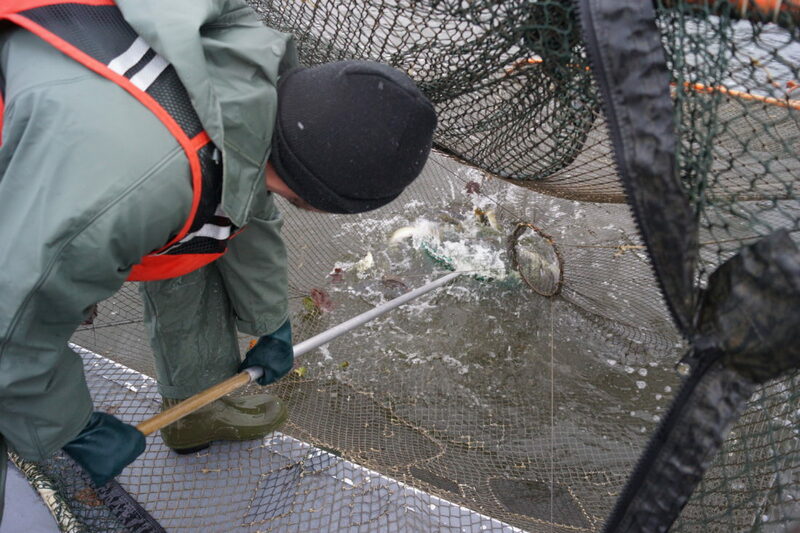 Collecting comes in the form of staff placing net traps around the sanctuary, which are also used to catch musky later in the spring, also to spawn. Each day the nets are emptied and the fish are sorted out. The staff meets a quota set of how many females and males to pull in. “We get more males than females because the males hang out in the spawning areas waiting for females, while the females come in when they are just about ready to spawn,” Sayers said. It’s important to check those nets everyday. It’s not only walleye that’s being caught but crappie, catfish, musky and other warm water species of the lake to ensure survival of them all. “We check the nets every day once we start. The nets catch so many fish,” Sayers said. When the boats come in full the staff begins to sort them inside the hatchery. From green to ripe — the ripe fish being the ones that produce eggs and the green without — staff apply pressure to the bellies of the ripe fish to extract eggs. An easy way to distinguish a male from female by looking for a swollen belly. “The ripe fish are spawned each day and the green fish are held in the hatch house in slightly warmer water which helps their eggs develop faster and within one to three days, the green fish will be ripe fish that we will spawn with the ripe fish caught that day,” Sayers said. The spawning process starts with eggs from two females put into a pan, and then extracting the milt or sperm from two males. “This ratio provides for the best genetic diversity of the offspring while also providing enough milt to fertilize all of the eggs if one of the males is a dud,” he said. The eggs need to be constantly stirred or they become extremely adhesive and will clump together within minutes. The staff uses turkey feathers to do this, and Sayers said it’s a unique tradition here. “That’s how the old timers did it, and we like the nostalgia. The feathers are gentle on the eggs and don’t break them,” he said. After the fertilization is complete, the eggs go into the water hardening process. “This is where the egg absorbs water from its surroundings to swell up and become firm. This process takes about 45 minutes to an hour,” Sayers said. The water the eggs are placed in are absorbing the iodine added to it. This is used to kill viruses or pathogens passed from the parents and to keep from spreading to the waters where they are eventually placed. “Our brood fish as well as the fry and PH1 or Phase One Walleye are all tested each year and have never tested positive for any disease,” Sayers said. After the eggs absorb the iodine, they are transferred to a larger bucket or keg where clay is added to the water, he added. The clay removes the adhesiveness of the eggs. Fresh water is then added and the eggs are allowed to sit for at least an hour longer to make sure they are fully water hardened before we move them to the egg battery jars, Sayers said. Jars are filled to an approximate measurement, and then samples are pulled to determine how many eggs are in each milliliter, giving the total count of eggs collected on each day. But after the 10 day mark, staff can see a black dot in the eggs, the eyes of the fry and known as the eye stage. Linesville and Pleasant Mount Egg Hatchery, north of Scranton, both contribute to the raising of stocked fish across the state. Waters here warm up a bit later then at the Pymatuning Sanctuary, so they take eggs later in the season, and Sayers says they serve as a backup in case all the fry commitments in the state aren’t yet met. Another 30 million eggs go to the Tionesta Hatchery to stock fry in a few lakes and rivers around the state including the Allegheny River. Eggs that stay at Linesville take about 14 days to hatch from the day they are spawned. “When they hatch, they swim out of the egg jars and fall into water troughs where we can direct them through PVC pipes to any tank we want” Sayers said. Ten million fry are stocked into Pynaumtuny Lake from Linesville, and half of those get marked with a chemical called Oxytetracycline (OTC). This is used by fisheries managers they can then look for that mark in fish they catch in their lakes and determine how much hatchery fish are adding to the population. Since walleye fry are very aggressive and their mouth is fully formed on day three post-hatch, those fish should be stocked or fed brine shrimp, or they become cannibalistic. “A majority of the fry get stocked in Pennsylvania lakes and rivers, but a few million are held back and stocked into production ponds,” he said. Ponds at Linesville are filled based on projected water temperatures and the expected amount of sunshine in the coming weeks. Plus the addition of just the right amount of nitrogen and phosphorous to the ponds. “We carefully manage these ponds to produce large amounts of single celled plants, or phytoplankton. The phytoplankton then feeds the tiny animals or zooplankton, which feed our small walleyes,” Sayers said. All-in-all if everything goes well Sayers said the hatchery can grow 400,000 to 1.2 million 1 1/4 inch walleye in about 33 days. The PH1 walleye ponds are usually harvested around Memorial Day each year and the fish are stocked based on a prioritized list of lakes that fisheries managers create each year, he added. “The PH1 Walleye are the real commodity and can make a huge difference in creating angler success and build populations,” he said.